An Israeli security forces sniper aims his weapon toward Palestinian protesters during clashes in the east Jerusalem Arab neighborhood of Issawiya, Oct. 4, 2015. Immediately after returning to Israel from New York, Netanyahu and his top security chiefs held emergency talks on a surge in Palestinian violence against Israelis. The prime minister said demolitions of terrorists' homes will be speeded up, security forces in Jerusalem and the West Bank will be bolstered, and jailing suspected terrorists without trial will be expanded. Israeli police already said they are temporarily barring Palestinians from Jerusalem's Old City, and that men 50 years and younger will not be allowed in the al-Aqsa mosque, a major Muslim holy site that has been at the center of the recent violence. Some Israelis and moderate Palestinians are worried the surge in violence is the first sign of another Palestinian uprising. Earlier Sunday, Israeli police shot and killed a Palestinian who stabbed and wounded an Israeli teen outside the Old City. 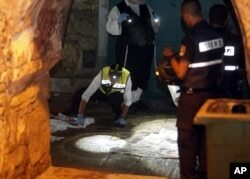 On Saturday, a Palestinian attacked an Israeli family near the al Aqsa mosque, killing the father with a knife and wounding his wife and toddler son. 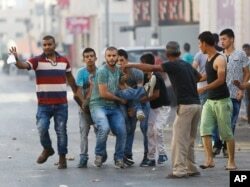 Several Israelis were killed last week by Palestinians, who have thrown stones at Israelis and police near the mosque. The Palestinians have accused Israeli authorities of trying to restrict them from visiting the holy site, which Jews revere as the Temple Mount. Under a long-standing agreement, Israel controls the site but gives Muslims the right to visit and worship. Jews can visit, but are not allowed to pray there. Palestinians carry an injured man during an Israeli military raid in the West Bank city of Jenin, Oct. 4, 2015. Tough talk from Netanuyahu and Palestinian President Mahmoud Abbas have made the chances of a negotiated peace and two-state solution between Israel and the Palestinians appear even more remote.